London: It’s perhaps the world’s toughest school run? 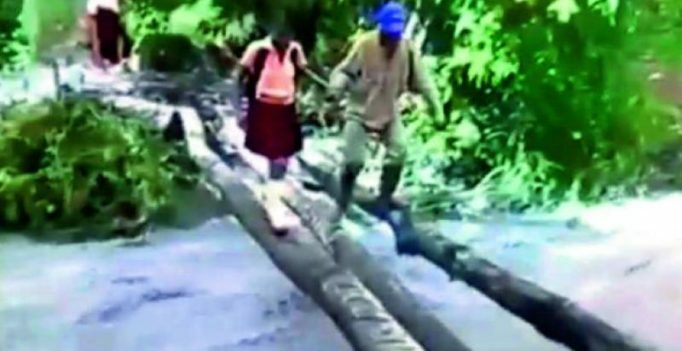 Children balance on a log over raging torrent to get to class. The improvised bridge has been laid across a fast-flowing mountain river near the town of Manaure in northern Colombia’s Cesar region. According to reports, dozens of children are risking their lives every day by using the rickety structure — consisting of three logs laid bank to bank — to get to and from school. Locals told reporters that the crossing is extremely dangerous as water splashes up from the river below, making the logs wet and slippery. They fear that a child will slip and fall in the river where they would most likely be washed away and drown. A video showing two high school pupils making their way gingerly across the rapids has gone viral on internet forums. It shows one boy walking across a single log on his own, and then another boy being escorted over by a visibly worried parent. The video was filmed and sent to a national TV station by local man Carlos Andres. He hoped to put pressure on the local mayor.